And yes, he was robbed. Freddie P. Must be foaming at the mouth about now. When is this happening? I have a feeling that it will be before the Habs game on October 13 meaning the game is going to start a lot later than they say it will start. You know what. They should have these ceremony things maybe an hour before the game or so so the games can actually start on time. That's my opinion. I'm not saying you have to agree with it. Go Habs. But they televise these ceremonies, so they can't start them an hour before the game when nobody's in the arena and nobody's watching. I don't mind the ceremonies when it's deserved. I still watch the Wendel Clark montage they played when they honoured him at the ACC. I hear he's the first player to end his career as a Canuck and make the HHOF. From what I hear, the players aren't fond of the ceremonies either. All the standing around throws off their concentration and timing. Another thing, and I don't have a stat on this, but it seems that when the Leafs do something special in a ceremony, it's almost a guarantee they'll have a clunker (a typical game) afterwards. I wonder if this will give cause for anyone to re-evaluate their stance on Mats' time with the Leafs? The Leafs should take a page from the Jays' book and officially retire the numbers of HOFers. 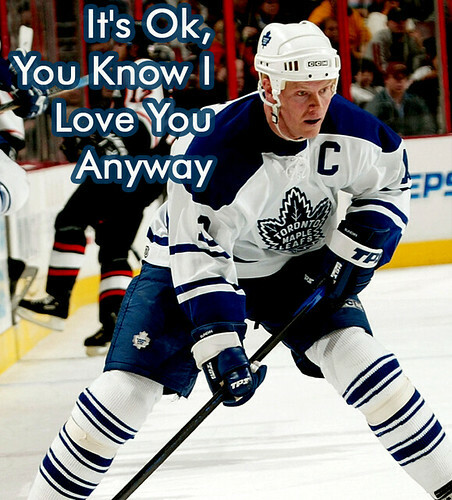 Sundin is easily on my top 3 Leafs I've actually seen play, but Mats getting in and Shanny not is a travesty...just saying. In order, my all time favourite players. In the 80's (when he was healthy) Hartsburg was the classic stay at home d-man, but with some decent offence when necessary (he held the Stars record for points by a d-man up until a few years ago). Sadly, Hartsburg has little hope for the hall. Shanny was THE man for me after Hartsburg retired. I loved his in-your-face attitude. He was gritty, he'd fight, he'd score (655 times if Im not mistaken) and was a natural leader. Lets face it, he probably would have had the C in Detroit if it wasn't for some guy there named Steve. So, I'm pretty happy Joe is in. And as much as Shanny getting left out bums me out, it really is only a matter of time for him. @519 Rob - At least you will get 2 in. In order, my my all time favourite players. Like me, the only way they get into the Hall is buying a ticket. Well, here's how you solve the ceremony problem. Announce the ceremony. Say it will be an hour before the game and give tickets for it so people have a choice. They can get tickets for the ceremony or the game. I find the ceremonies are getting longer and longer these days and then it ticks me off because I expect the game to start on time, but starts a lot later. Well, found out the Sundin thing is on November 12 so it won't affect the Habs game. Heard Jim Richards on the H&F podcast today state that if you were to look at Sundin's numbers without seeing his name attached to them, you wouldn't be impressed. He said, "His numbers were never that great." A great example of the irrational anti-Sundin mindset of a lot of "real Canadian hockey fans". Let's see, he's 29th all-time for regular season points-per-game, which puts him ahead of Hall of Famers like Ciccarelli, Gilmour, Gartner, and Robitaille. He's 27th all-time for regular season points, ahead of Hall of Famers like Savard, Gartner, Perreault, Bobby Hull, Bernie Nicholls, and Bobby Clarke. 21st in regular season goals, 18th in short handed goals, 7th in game winning goals, #2 all time in OT goals. The predictable rebuttal to these numbers is that Sundin "disappeared" in the playoffs, but again, the numbers don't lie. Most game winning goals in the playoffs of any Leaf ever and first for game tying goals. First Leaf for shots on goal during playoffs. 2nd on the Leafs all-time (behind Gilmour) for points. How can a guy with those numbers "disappear" during the playoffs? Every one is astonished that Sundin got in before Shanahan, yet Sundin beats him in virtually every category. Still, "his numbers were never that great". Okay. Sure. @ Cory - I personally would never say that Mats doesn't deserve to be in the Hall. However, I would say that he should not be there ahead of Shanahan, personally I would have put Sundin, Shanahan and Pat Burns in and honor Oates and Bure next year.